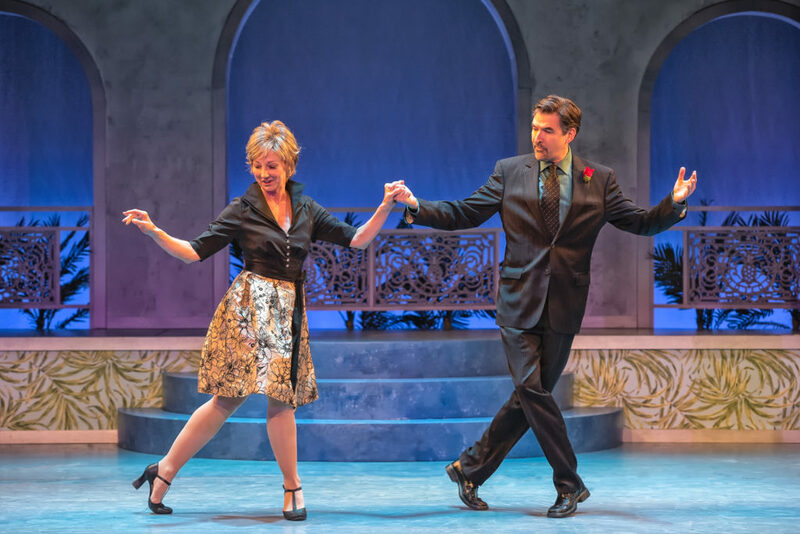 The Resident Theater Company started their next season, performing the show Dirty Rotten Scoundrels. 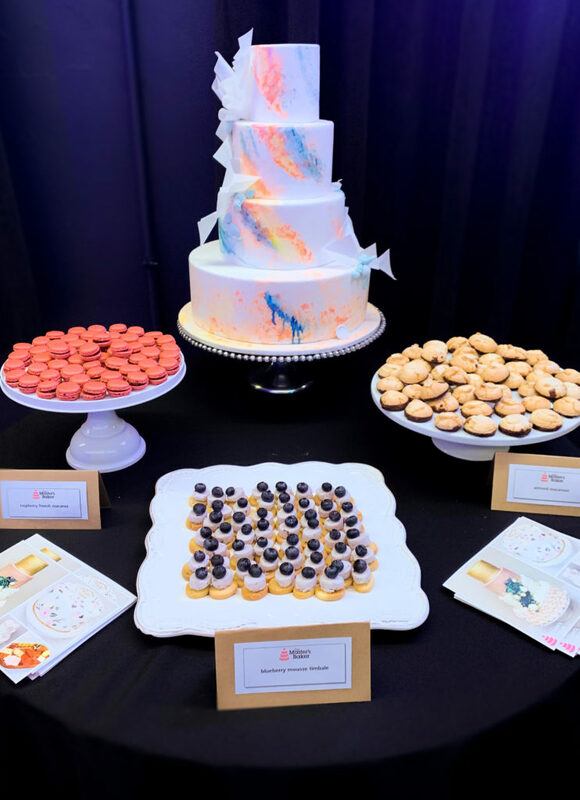 We were so excited to be invited to RTC’S opening night, this past Friday evening. While the show started at seven, we arrived at Uptown! Knauer Performing Arts Center around 6pm for a pre-party we were also invited to. This was a first for us, and it added a little extra excitement looking forward to see the performance. 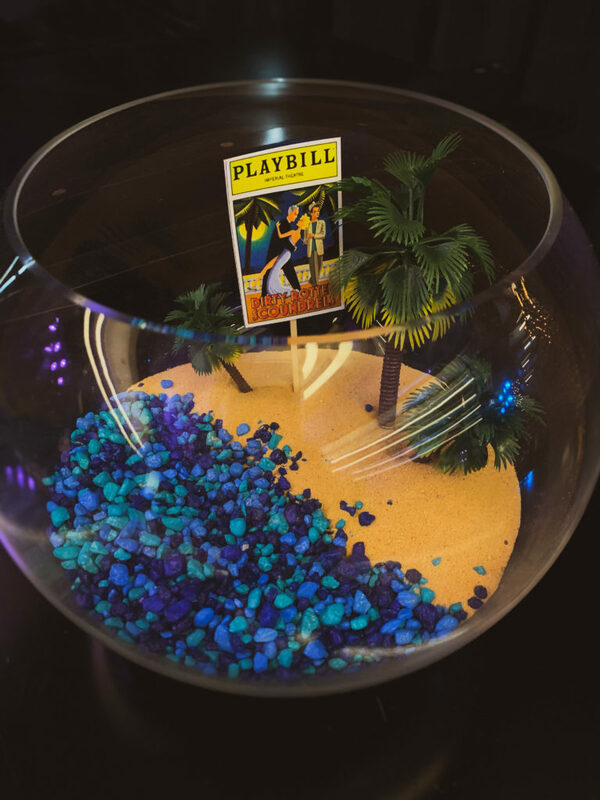 The pre-party was awesome, and had a “beach-vacation” theme; which perfectly matched for Dirty Rotten Scoundrels. They used blue tinted lights that beamed through the center of the room, tropical table decorations, and even specialty cocktails named after the show. After, around 6:45pm we walked downstairs to get ready for the performance. It gave us enough time to get our tickets, and find our seats before the lights dimmed. 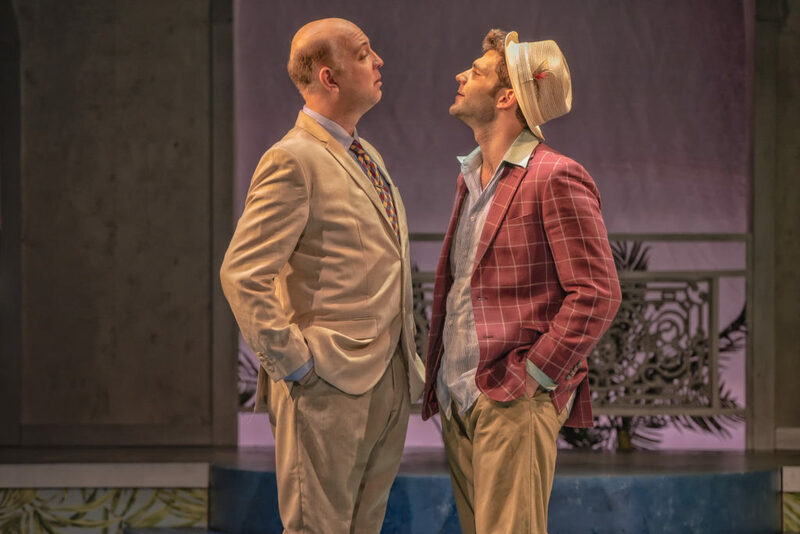 Some background information RTC provided us with in their printed program was that; Dirty Rotten Scoundrels is based on a popular 1988 film starring Steve Martin, taking place to the French Riviera. Music and Lyrics of the show are by David Yazbek (The Full Monty). The plot began with introducing us to con artist, Lawrence Jameson played by Mark Woodward. Lawrence’s suave personality was quickly revealed, as he romanced Muriel Eubanks played by Sarah Solie, and tricked her into giving him money. It was obvious that this wasn’t his first time swindling money from other women, he made a living from it. Muriel (Sarah Solie) broke the ice with the audience after singing, “What was a Woman to Do”. The song was made up of several jokes with a dash of adult humor, setting the tone for songs to come. Lawrence meets his match when Freddy Benson played by Lukas Poost walked into town. Freddy was younger, and a bit less sophisticated than Lawrence, but he knew how to play the game. by lying to a local woman about his “sick” grandmother. After seeing Lawrence’s fancy gala, Freddy begged him to teach him his ways. After a lot of convincing, Lawrence agreed to let him watch the “pro” in action. When Lawrence was showing Freddy how it’s done, Lawrence gets into a sticky situation with a country mistress named Jolene Oaks, played by Michelle Lemon. The two men worked together driving her away, with Freddy acting as Lawrence’s “unique” brother. This was definitely, one of the funniest scenes of the production. After driving Jolene back to her home in Oklahoma, Freddy and Lawrence argued about who was the better scoundrel. A competition was proposed, to see who could get $50,000 from “the soap queen”, Christine Colgate played by Bailey Seeker; who came to town for a vacation. The loser of the competition was to leave town. The rest of the performance was full of twists and turns, with both men fighting to win. Without spoiling anything — we were very surprised with the ending and loved how it all turned out. RTC did a awesome job captivating the audience by having a few actors appear from where we were sitting. This brought attention to other areas of the theater, which was an great addition. The entire cast had a tremendous amount of talent, when it came to singing and dancing throughout the show. We were particularly impressed with the pipes on Freddy (Lukas Poost) and Christine (Bailey Seeker), hitting some insanely long high notes in both their solos. This brought the plays energy to a different level, along with the challenging dance numbers. Overall , RTC once again, set the bar high performing another hilarious, absorbing, enjoyable production. We were honored to be there to be there to see it! 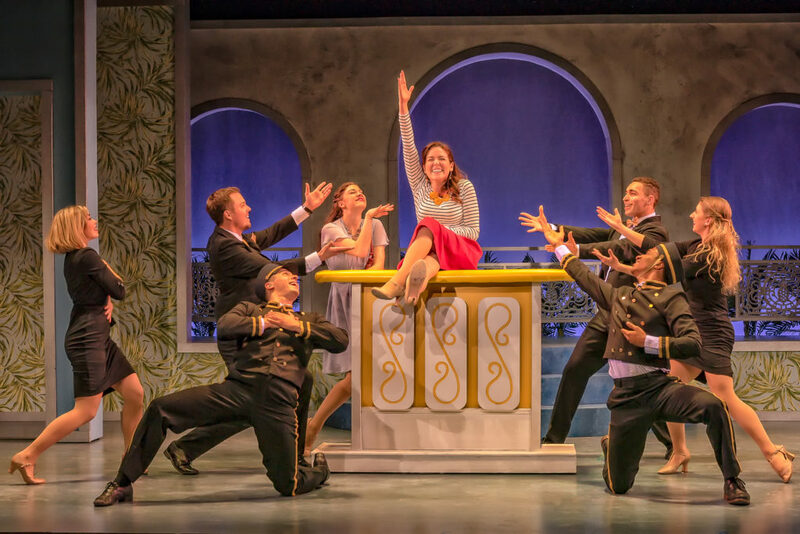 Luckily, Friday wasn’t the only night that RTC is performing The Dirty Rotten Scoundrels. You can see the performance up until April 14th, and purchase tickets online. We definitely recommend this show to any adults who’d like a night full of laughs and fun!